Offering you a complete choice of products which include xtra floor standing water dispenser with non-cooling cabinet, atlantis xtra table top water dispensers for offices, atlantis xtra water dispenser with cooling cabinet and atlantis xtra water dispenser. 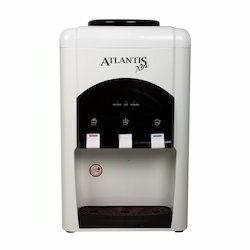 The Atlantis Xtra Hot Normal Cold Floor Standing Water Dispenser with Storage Cabinet is engineered with advanced electronic cooling and heating methods to provide you with safe and efficient ice cold water and hot boiled water for making tea, coffee, cold drinks, soups and more. 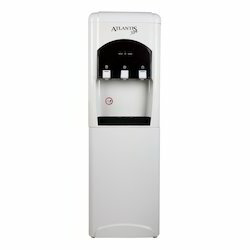 The Atlantis Xtra Water Dispenser provides quick heating and cooling with low noise and low power consumption and features a lightweight and stylish design that is perfect for the home or office. The water dispenser is equipped with a bottom storage cabinet and accepts all 20-liter water bottle. Range available from 2.5 liters to 10 liters PH with up to maximum storage capacity of 13 liters. Our Hot & Cold water dispenser with cabinets comes with easy to push button and a child safety lock on the hot water over the counter. These dispensers have a 16L cooling cabinet with a spill-proof design to reduce wastage. The unique design and features make Hot & Cold water dispensers an ideal choice for big and small organizations. We are supplying cooling dispenser, water cooler dispensers, water dispenser with cabinet, beverage dispensing equipment, bottled water dispenser system, dispensing systems, bottled water dispensers, drinking water dispenser, water cooler dispensers etc. 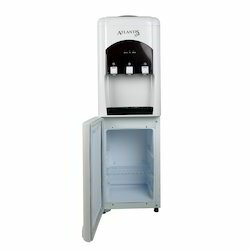 The stylish Atlantis Xtra Hot Normal Cold Floor Standing Water Dispenser is ideal for use in your office, reception area, waiting room or other shared space to ensure there is always fresh water available. The cooler has 3 taps so you can enjoy hot, cold or room temperature water.